We’ve all been there. It’s 8:05 am and the work day has just started when you notice that run in your stockings or the unsightly dry cuticles, and that meeting with your boss and clients starts in 25 minutes. That’s not enough time to run to the drugstore to pick up a remedy, so what’s a girl to do? As an 8-to-5 career girl myself, I have gathered a few tips, tricks, and products along the way that I’ve packed up into a neat little kit to keep at my desk. While it’s true that the kit will vary depending on your personal needs and preferences, here are a few staples that you should add to yours. This little pot of gold is as versatile as it gets! Not only does it do wonders for dry areas (think: knuckles, elbows, knees) it also softens cuticles and chapped lips. The cosmetic uses for Rosebud Salve include everything from enriching lipstick by applying a layer over the color to adding a glow to cheeks or collar bones. While some people like to use this as a frizz or fly-away tamer, I prefer a less balmy approach like the next product. The static guard isn’t just for your clothes. While this helps to have in your kit for the sole purpose of static, clingy clothing (I’m looking at you, stockings! ), it is also a magical remedy for out of control flyaway hair. Merely spray a little on a small brush and run it over the problem area. Your hair will keep in place better than with hairspray that, while a wonderful product, is only useful for one thing… hair. Got a furry little friend at home? Static Guard also helps easily remove pet hair from clothes. Simply spray it on the area, then wipe or brush it away. Most people know all about the advantages of blotting paper, especially those with oily skin. For a quick pick-me-up during the day, reach for your blotting paper to dab up any excess shine too quickly refresh your skin. Blotting paper also does wonders for a day old blow-out. If your bangs are looking a little less than fresh, simply massage the blotting paper onto the roots of your bangs to grab that excess oil and fluff up them up for a fuller look. If you use a liquid foundation and touch up throughout the day, use blotting paper to remove the excess (without removing everything!) and even out the “fixed” areas. I recommend the powder-free sheets if using the paper for fixes other than just an oily T-zone. Forgot to polish your nails before the meeting? Give your bare nails a quick shine with a layer of clear polish. Not only does it look neat and presentable, but it is also much friendlier in a quick-fix situation than color polish. Swipe a coat of clear polish over fraying thread in a loosening button on your trousers or blazer to keep it in place, at least until the end of the work day! If you wear stockings or tights, you know that runs and snags are almost too easy to get. When it’s too late to change into a fresh pair, simply dab some clear polish to prevent the run from getting worse throughout the day. Hairstyles fail. This is an unfortunate reality that we face more often than we care to admit. Bobby pins offer a quick way to fix that fallen up-do or even provide a way to pin up those locks that looked perfect this morning but fell victim to the summer humidity. In addition to all of those hairstyle needs, bobby pins also offer a get-out-of-jail-free card when the zipper pull on your trousers or skirt breaks. A bobby pin can also temporarily replace the loop keeper on your belt to prevent an unsightly, sloppy look. While Bobby pins can temporarily hold a loosened hem, fashion tape is a lot more discreet. It is a lifesaver when, just after arriving at work, you realize that maybe your low-cut top is a little too revealing. Extra-long sleeves? Keep them back with fashion tape. The double sided lifesaver can also double as a replacement for a lost button to keep your blouse in place when your emergency mini sew kit isn’t an option. 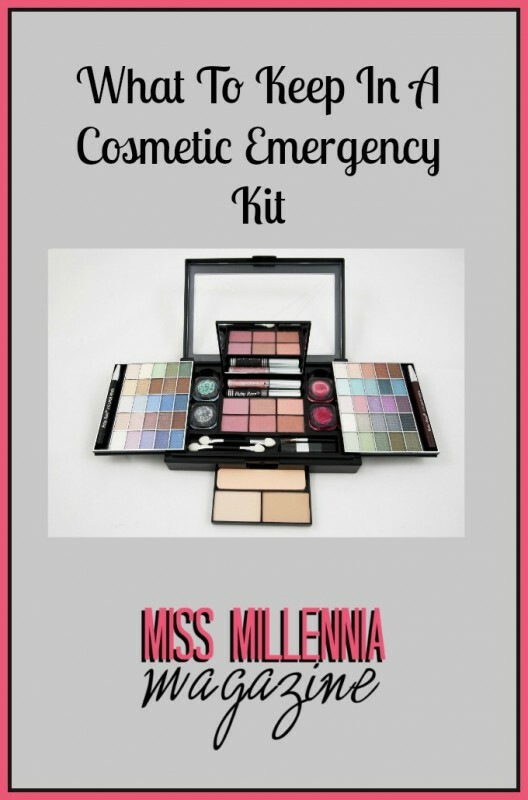 While those staples can always be found in my emergency kit, there are a few other items I highly recommend to keep on-hand if you can afford the room in your kit bag or desk drawer: safety pins, mini deodorant, a roll-on version of your signature scent, hand lotion and sanitizer, floss, breath mints, a stain remover stick, lip gloss, a compact mirror, and a glass repair kit. We can’t prevent or remedy every sticky situation that arises, but with these few simple items in your emergency kit, you can surely knock out most of those pesky little issues! What are some of your emergency remedies?